While most of my sessions are done in the comfort of my South St. Louis Studio, I do love getting the opportunity now and then to go out and do something a little more personal and unique for my clients. 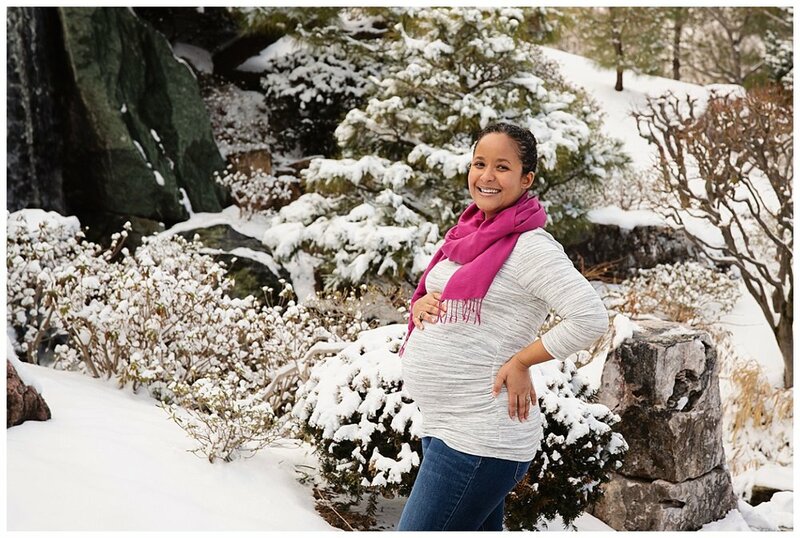 This beautiful couple had a membership to the Missouri Botanical Garden and wanted to bring a little color into their maternity shoot even though it was done during the winter. If you have lived here long enough, you know how unpredictable the weather can be. This time, it really worked to our benefit. The morning snow cleared in time to make getting to the Garden relatively easy and created a gorgeous backdrop for the end of the session! This is Mom’s favorite view at the Japanese garden… Of course we had to work it into the session. I admit that the idea of shooting in the cold can be a little daunting, but when these are the results it is definitely worth the effort.